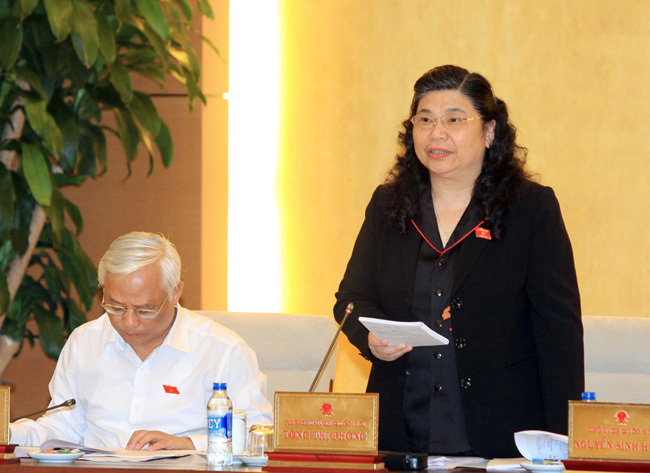 HA NOI (VNS) — The National Assembly's (NA) Standing Committee convened its 37th meeting yesterday. Lawmakers held discussions on the draft Law on Information Security, which consists of nine chapters and 56 clauses, aimed at addressing ongoing concerns such as cyber attacks, rampant junk email-ad and text messages, suspicious software, personal information protection and protection of national interests. The Internet has become an integrated part in the country's economy, but it also exposed individuals, organisations and businesses to numerous cyber threats, said the Minister of Information and Communications, Nguyen Bac Son. The Law on Information Security, once implemented, will provide the legal framework for the development of information and communication technology, which contributes greatly to the country's socio-economic development as well as national defence and security. Chairman of the NA, Nguyen Sinh Hung, noted that the law must uphold the spirit of the 2013 Constitution in protecting the people's right to access information as well as existing laws and regulations. NA deputy chairwoman Tong Thi Phong said the draft law must also specify how to proceed and penalise responsible parties in cases where violations were found. The meeting, which will be held from April 6 to 10, will discuss important draft laws on information security, administration fees, the Penal Code, criminal procedures, maritime affairs, the State budget, Government organisation and election of deputies to the NA.